Countless hordes of both hater and fangirl users are currently castrated, paralyzed, and disfigured for daring to edit this page. Note: You certainly aren't looking for a novel with this title, are you? I'd have mentioned it if something like that existed. A photograph of Twilight. The "trumpet-bird" monstrosity is unrelated. Twilight is a meteorological phenomenon that occurs near sundown or sun-up where ambient light from the sunset/sunrise nullifies the effect of other, closer light sources. This also manifests as a glittery appearance on certain breeds of vampire. It is frequently romanticized in novels as a magical time of mystery, love, and other such boring things, and in video games as one of any number of descriptors to chain to the name or a proper noun. 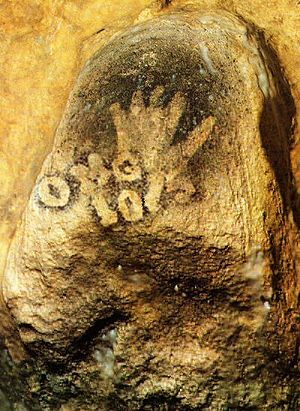 This cave drawing, found in Japan, appears to be a proclamation of love for link sausages. Top scientists are still working around the clock to figure out why this is. The first recorded incident of Twilight is recorded by cave drawings in Japan, which is stunning since all the caves there were thought to have been demolished, between near-constant earthquakes, massive construction efforts, and near-constant technochauvinism. It apparently chronicles the deeds of a sub-human species, or at the very least, the life of one of them, named "Midna". In their language, this name is thought to represent "Mechanical Aspect Turned Slashfic Recipient", showing a history of literary abominations preceding anything in known development. The earliest stable historical recording of Twilight was discovered by a scientist by the name of Stephanie Meyer in 1931... or maybe 1876. We'll need to confirm the info from our sources. In any event, Meyer discovered this while consorting with a particularly creepy circle of vampires whose name has been lost to history, but were known for thinking themselves to be much more romantic than they were dead. The most noticeable effect of Twilight is the nullification of natural light sources, which, combined with the low light from the sun itself, allows an unparalleled view of heavenly bodies. Stargazers around the Tropic of Cancer or Capricorn have the optimal view for looking up their skirts/shorts. It is also known to allow for a good view of objects in the distance (for example, mountains, giants, and thermonuclear weaponry). For some indiscernible reason, it makes underage wizards extremely irritable and unwilling to listen. Finally, the last known effect of Twilight is to render upon vampires an inexplicable luster. Some speculate that this may have been intended as a defense mechanism against sunlight. Since sunlight still burns vampires as if they were pasty teenagers who spend all their time brooding in their room near the computer, some people dispute this claim. For some reason, in the early 21st century, a large public outcry against Twilight arose, perpetrated by either the aforementioned underage wizards or just people willing to complain about anything under the sun. Since the sun is technically under Twilight, this is one of the first commonly dispelled arguments but, like all arguments revolving around mistakes in rhetoric, this is frequently shot down with contempt for the guilty party's intelligence. In any event, there appears to be no method of pleasing these self-dubbed "Twilight haters" since it is an ever-present feature of the Earth, and thus the movement is disregarded on accounts of sheer unpleasability. A few fringe scientists are attempting to develop methods to nullify the effects of Twilight in major cities, although progress is limited, and considering the meteorological scope of the phenomenon, downright mad-scientist in their procedures. So far, the most reasonable such solution involves country-wide satellite mirrors that would provide secondary "suns" even during times of Twilight. The less reasonable ones tend to involve gross misogyny, for reasons completely unknown to society at large. One "Link" is investigating using souls of invisible monsters to dispel twilight, with varying results.